One of Lawrence Bacow’s goals at Tufts University was moving from a merit-based to a need-based system of student aid. When Lawrence Bacow arrived at Tufts University in 2001, he vowed to transform the school, with its aging buildings, meager endowment, but sky-high ambitions, into an institution that could compete with the likes of MIT. A decade later when Bacow stepped down from the Tufts presidency, the university hadn’t reached the status of the Massachusetts Institute of Technology, but its endowment had nearly doubled, research funding had skyrocketed, financial aid to needy families was a priority, and the school had built an international reputation by drawing a higher caliber of faculty and students. As Bacow, 66, prepares to take over the Harvard University presidency on July 1, his work at Tufts offers a window into what it takes to make strides at a university — especially one without the boundless resources of his new home — and the intractable challenges that remain. Bharucha recalled that he was initially hesitant to leave an Ivy League post as faculty dean at Dartmouth to come and work for Bacow at Tufts. In the Boston area, Tufts was outflanked by its neighbors, MIT and Harvard, and to some people maneuvering away from those shadows seemed to be an impossible task, he said. Although some have said they’d hoped the winning candidate wouldn’t be a straight, white man. But Bacow made a compelling case and had clear priorities for Tufts: turn it into a premier learning institution and improve access to education for low-income students, Bharucha said. “It was a very heavy lift for Tufts and Larry did as much as anybody could,” he said. At the time Bacow was selected, Tufts was a 9,000-student university known for its health, science, and international affairs programs. During Bacow’s tenure, Tufts added 1,695 students to its rolls. The average combined SAT scores of entering undergraduates rose by more than 100 points, to 1420. And by 2009, the university was bringing in $147 million in research grants, up from $81 million in 2000. Jean Mayer, Tufts’ forceful president from 1976 to 1992, had already propelled the university from a regional institution to a nationally known university. Bacow’s predecessor, John DiBiaggio, was well-liked in the Tufts community and considered a persistent fund-raiser. But Tufts’ donors and leaders worried that the university had lost momentum. The university needed to make expensive updates to its laboratories and facilities, faculty members were grousing about the lack of substantive raises, and Tufts’ well-regarded veterinary school was on shaky financial footing. 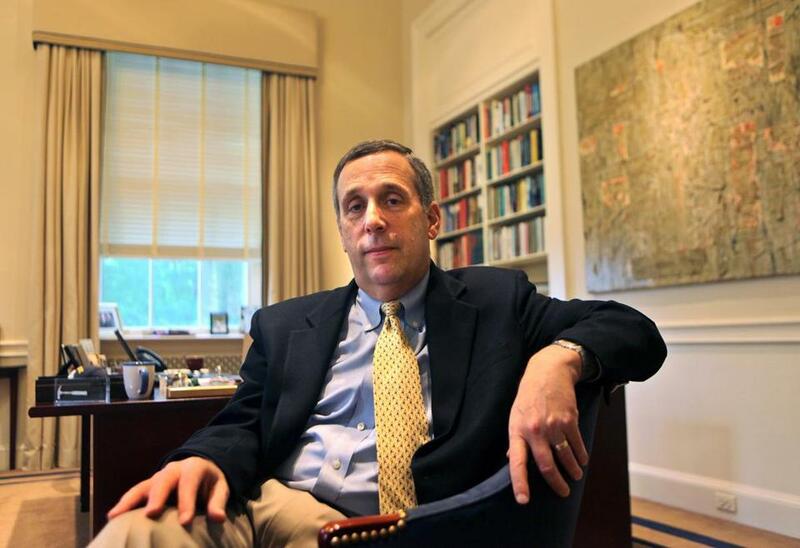 The Tufts board tapped Bacow, who was then an MIT chancellor, to help re-energize the school. At first, Bacow’s goals, particularly for moving from a merit-based to a need-based system of financial aid for students, seemed “so far out of grasp,” said Steve Manos, a former executive vice president at Tufts who worked for three presidents, including Bacow, handling financial matters. But Bacow stressed that improving access to college was important and then traveled the country and the world to raise the money for the initiative, Manos said. And when the financial crisis hit in 2008 and cut into Tufts’ endowment returns, Bacow personally called individual big donors and pleaded for financial help so that the university could continue its promise to offer need-based aid, Bharucha said. Tufts increased financial aid for undergraduate, graduate, and professional students by almost 94 percent during Bacow’s tenure and in 2007, it replaced loans with grants for undergraduates whose annual family income was below $40,000. According to federal data, by the end of Bacow’s tenure, incoming first-year students received $10,000 more on average in Tufts grants than they had when he arrived. However, the overall share of incoming students getting these grants rose only slightly. During that time, the cost of tuition, room, board and fees at Tufts also climbed by about $18,000. Overall, the percentage of students enrolled at Tufts who qualified for federal Pell grants, a marker for needy families, has hovered around 10 to 11 percent, far lower than other competitive, four-year institutions. Having significantly improved financial aid while Bacow was president, Tufts remains committed to expanding accessibility to higher education, said Patrick Collins, a Tufts spokesman. Increasing the percentage of Pell grant students, “continues to be an area of focus,” he said. 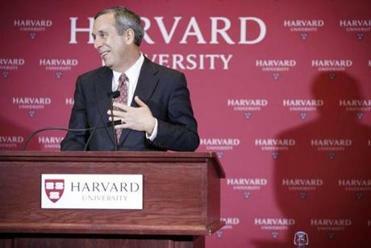 At Harvard, Bacow will have a much larger platform to advocate for opening up higher education to more students and more resources to expand access. Harvard has a nearly $37 billion endowment, compared to Tufts’ nearly $2 billion endowment today. Still, despite Tufts’ limited resources, those who worked with Bacow said he was able to push the university forward. He launched a $1.2 billion fund-raising campaign, building alumni networks overseas that helped boost donations. He was as comfortable chatting with barons of financial powerhouses as he was hosting small dinners for all the seniors at the president’s house every spring, said Gretchen Dobson, who worked on international alumni relations at Tufts under Bacow and now does similar work for a private company, Academic Assembly Inc.
“He was a phenomenal brand ambassador,” Dobson said. By 2010, the Tufts endowment had grown to $1.4 billion, up from $600 million when Bacow started. Under his leadership, the university spent that money on laboratory space to recruit faculty and fund other capital projects, including a music center and dormitories. Still, Bacow, a former economist, had to be watchful about the budget, Manos said. During the 2008 financial crisis, Tufts scaled back on its capital projects and froze salaries.